South African Chef Jacques Van Staden is the man behind the inspired restaurant, Qsine onboard the luxury Solstice Class Celebrity Cruises - Eclipse where you can expect the unexpected. A James Beard Foundation "Rising Star of the Year" nominee, he excels at taking guests' palates on a culinary world tour. He shares his Qsine vision with his creative recipes for Lobster Escargot, Lava Crab, Vegetable du Jatour: Carrot-Cardamom Purée - Sweet Potato-Raisin Purée - Truffle Potato Purée, and Chocolate Tombstone. 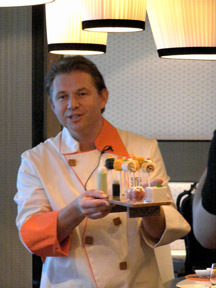 I had the pleasure of dining at Qsine during its inaugural sailing in November 2010 from the port of Miami, Florida in the United States, and I had the opportunity to meet the personable and creative Chef Jacques Van Staden. Passionate about cooking from the age of seven when he used to assist his Italian grandmother, by age 11 he was cooking the family's large Sunday dinner, and at the age of 14 he was working in a French restaurant, unbeknownst to his father who thought he was playing rugby. After graduating from high school and doing his 2-years of military duty, he knew that he wanted to pursue a culinary career in the United States. Airline tickets to the United States from South Africa were expensive, yet undaunted he sold his car and purchased a ticket to Washington, DC where he stayed with a friend whose parents had been diplomats in South Africa. Fueled by the enthusiasm of youth and armed with culinary expertise from the prestigious L'Academie de Cuisine in Bethesda, Maryland, he set off to hone his craft working at such illustrious restaurants as Jean-Louis in Washington, DC; Alizé in Las Vegas, Citronelle in Georgetown, owning his own restaurant, and at the Watergate Hotel in Washington, DC where managed 250 employees. 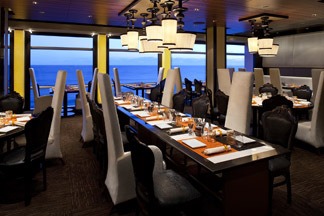 In 2007, he joined Celebrity Cruises where his title is Vice President of Culinary Operations, and he is the vision behind the 10 highly diverse restaurants onboard the Celebrity Solstice and Celebrity Equinox ships. His inspiration for Qsine came from wanting to do something that he calls "uniquely unordinary" going 360 degrees from your perception but with familiar food. Specially designed plates and whimsical staging helps break down inhibitions and it is more than just the food, it is the "visual presence, and great interplay between the chef and the guests." It is a restaurant where "everything is fun and nothing is serious, except the food." 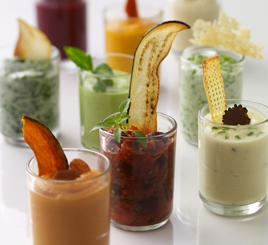 Chef Jacques Van Staden shares a few of his innovative recipes to tempt your palate before you set sail on a Celebrity Eclipse ship. Bon Appétit! Edward and I experienced the Lobster Escargot at Qsine, and they were pure magic; rich, flavorful, and with a sauce that was made for dipping. Method for the lobster mousse: Remove the lobster from the tail, cut into small pieces and place in a food processor on low speed. Add cream and continue to pulse in processor until a smooth consistency paste forms. Remove and place the mousse in mixing bowl and store in the refrigerator until needed. Method for the escargot stuffing: Sauté the escargot with the olive oil, garlic salt, pepper, and thyme. Then deglaze with the white wine and simmer for 2 minutes, remove from the heat and let it cool down. When the escargot has cooled down, lightly chop it in large pieces, then add the chopped escargot to the diced lobster tail, lobster claw meat, parsley, chives, lobster base and pepper and mix all ingredients together then remove the lobster mousse from the refrigerator and mix in well, and set inside the refrigerator. Method for the garlic-parsley butter: In a food processor, place the parsley, tarragon, garlic base purée, anchovies, salt, and white pepper. Purée until a fine consistency, then add the butter and purée until mixed well. Remove and place in a disposable piping bag. 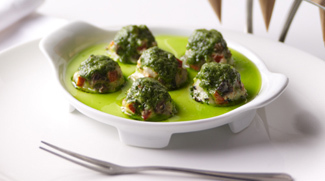 In escargot dish, pipe a small amount of the garlic-parsley butter in each of the holes. Scoop one ½-ounce escargot stuffing into each hole. Pipe additional garlic-parsley butter on top. Place in the oven and cook until butter is melted or the escargot lobster stuffing is lightly golden brown (about 12 minuets). Serve with warm brioche bread. Chef Jacques Van Staden uses Kataifi Phyllo Dough for his Lava Crab, which provides a wonderful crispy texture, and was one of our many favorites at the restaurant. Note: To cut brunoise method you first cut the tomatoes julienne, then turn one quarter, and cut again to create small dice. Kataifi Phyllo Dough is thinly shredded dough. Method for the crab mixture: Set the crab aside in a strainer to drain liquid. In a mixing bowl, whisk the egg yolks, mayonnaise, mustard, Tabasco, chives, tomato, tarragon, salt, and nutmeg together. Add the crab to the ingredients in the mixing bowl and fold with hands. Add the panko breadcrumbs and mix well. Scoop 2-ounce balls of mixture onto a sheet pan and set aside. Wrap the crab balls in kataifi phyllo dough until enclosed and completely covered. Place on a sheet pan, cover, and set inside the refrigerator. Method for the Old Bay Sauce: In a pot sauté the shrimp, onions, and garlic, in the butter until lightly browned. Add the tomatoes and tomato paste and cook for 8 minutes. Deglaze with the white wine and reduce until the wine is evaporated. Add the lobster base, Old Bay® seasoning, tarragon, thyme, and heavy cream, and let it simmer for 30 minutes. Remove from heat and purée the mixture in a blender. Strain through a chinois, and reserve until ready to use. Method for the kataifi crab: Place each kataifi wrapped crab on a spoon and slowly immerse into a pre-heated fryer set at high heat and fry until golden brown. Remove and drain on paper towels. Presentation: Pour 2 ounces of the hot Old Bay Sauce in each martini glass. Place the fried lava crab in the sauce, and garnish with chopped chives and serve. His Vegetable du Jatour is a play on his daughter's name and is a lovely vegetarian option. Method: Place the carrots and the rest of the ingredients in a pot and cover with plastic wrap (make sure to stir constantly so the carrots don't burn on the bottom) and simmer for 45 minutes on medium heat or until the carrots are completely cooked. Purée the carrots in a blender with a little liquid just to get the blender going. Then place the purée in a container and set in the refrigerator to cool. Once the purée is cool, place it in a piping bag, and then pipe the purée into a glass jar to the top. Place in the refrigerator until needed. To serve, reheat by placing the jar in a steamer or the microwave. Garnish with a carrot chip. Method: In a small sauce pot, combine sweet potatoes, heavy cream, salt, pepper, spices, honey, orange concentrate, cover with plastic wrap and place on low heat. Simmer for about 45 minutes covered or until completely tender. Remove from heat, place all ingredients, except raisins, in a blender and puree until completely smooth. Remove from blender, place back in pot, add raisins, and fold until well incorporated. Remove and serve immediately piping hot. Method: Place potatoes whole, skin on in a pot and cover with water. Place on high heat and simmer for about 35 minutes or until potatoes are fork tender. While potatoes are cooking, in a separate pot combine heavy cream, butter, salt, thyme, garlic, white pepper and bring to a simmer. Remove cooked potatoes and drain from water. While potatoes are hot, carefully peel and place through a ricer or masher into the cream and fold together with a rubber spatula until well incorporated. Once all is mixed well, add truffle oil, chopped truffles, mix well, and serve piping hot. Chef Jacques Van Staden's Chocolate Tombstone is a chocolate lover's fantasy creation of three luscious layers of chocolate and varying textures that make this an outstanding dessert. Sinfully rich and decadent, it is the ultimate ending to a wonderful evening. Method for the tuile batter: Pre-heat the oven to 350°F. In a small mixing bowl, mix the egg whites, powdered sugar, all-purpose flour and vanilla extract; add the melted butter and the food coloring. Chill in the refrigerator until set, with a sharp knife carve a Q design (or whatever letter desired) on a plastic sheet and place the plastic design on a greased parchment paper. Spread the batter mix over the plastic letter template, and remove the plastic sheet. Let the batter set at room temperature before baking the tuile designs for about 5-7 minuets or until lightly golden. Method for the gianduja rice crispy cereal cake: In a medium-mixing bowl, melt the chocolates together in a bain-marie or over a double boiler. Add the remaining ingredients and mix gently. In an 8-inch square mold, spread the rice crispy cereal mixture evenly, and press lightly down on the cake to help it form. Place the cake in a dry place to harden. Method for the chocolate mousse: In a medium mixing bowl, melt the chocolates together in a bain-marie or over a double boiler. Add the Nutella and salt to the chocolate. In another mixing bowl, beat the cream with the sugar until soft peak. Fold the whipped cream into the melted chocolate until a smooth consistency. Spread the mousse on top of the rice crispy cereal cake mixture and place into the freezer until it sets (about 20 minutes). Remove the cake from the freezer and let it sit out. Method to finish the cake with the ganache: In a small pot bring the whipping cream to a light boil remove from heat and stir in the dark semisweet chocolate until a smooth consistency (there should be no lumps, it should be as smooth as silk). Glaze the cake with the melted ganache and cool in the refrigerator. Presentation: When ready to serve, cut the cake into (6) portions. Place on a serving plate. Decorate each portion with Valhrona chocolate pearls and place the Q orange design tuile vertically on the side of each portion. When you dine at Qsine, be prepared for an out of the ordinary culinary adventure with Chef Jacques Van Staden enthusiastically and creatively leading the way. 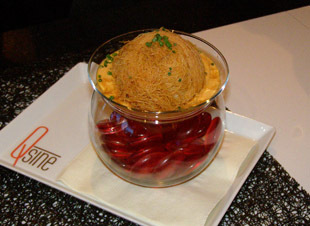 Read about Qsine in the Restaurants section. Read about Celebrity Eclipse in the Destinations, Restaurants, and Spas sections. For information on the Celebrity Eclipse and Celebrity Cruises, Inc., please visit the website: www.CelebrityCruises.com. © December 2010. Luxury Experience. www.LuxuryExperience.com All rights reserved.